Will Ever More Boomers Selling Retirement Assets Change Investment Prices For Decades? When investors pour cash into a market, all else being equal – prices rise. And when investors pull cash from a market – prices fall. If we accept that simple relationship, and agree that the basic laws of supply and demand apply to investments just like they do to the rest of economics, this could mean that we are in the early stages of a tidal reversal in the investment markets – which just may change everything when it comes to our future income and standards of living. As explored herein, what we believe to be true about investment prices and yields – what decades of market numbers show us, and what decades of personal experience have taught us – are all based on a unique set of circumstances, that has existed from roughly the early 1980s until today. This unique set of circumstances combined to become the largest and most reliable source of incoming cash for financial markets in history – and the markets responded. From here forward, however, with each passing year – that unique set of circumstances is not only coming to an end, but will be reversing. That is, the unique convergence of factors that reliably poured cash into the markets will eventually come to a stop, and then begin to reliably pull cash out of the markets. The Baby Boomers, those of us born between 1946 and 1964 – have never done anything on a small scale. We were the largest generation, and therefore much of what we did was the biggest in American history up until that time. First, we overloaded the school system, then we transformed the labor force and the economy, and then we transformed the housing market. We also became the biggest generation of investment buyers in history – and still are. Which necessarily means that the Boomers will gradually also become the biggest generation of investment sellers in history. Now, becoming the biggest generation of investors involved much more than just the total number of people, for what mattered even more was the percentage of the population who were buying investments. New tax-advantaged savings plans came out: IRAs, 401(k)s, and many others, which were intended to encourage middle class investors to participate in the investment markets. Besides widely broadening the base of investors, the new plans were designed to alter investor behavior, through the use of the tax code to encourage tens of millions of people to put as much cash as possible into the markets each month of every year. Of at least equal importance was that the tax code created another revolutionary change in investor behavior – which is that you could put your money in but you couldn't take it out, at least not without substantial penalties. Instead, once the money was put in the financial markets, for younger investors it couldn't be taken out for decades, a restriction that was supposedly for the greater good. There was a third and even more important twist to the new regulations that spurred another crucial change in investor behavior as a matter of law, but which is not generally understood by the general public (even if very well understood by the investment industry). In prior years, many wealthy people had purchased investments so that they could support a comfortable lifestyle based on the income generated. 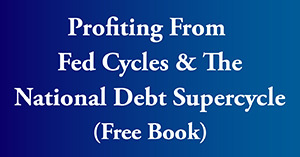 So cash was paid out by the markets in the form of dividends and interest income – and it often left the markets. With the new regulations, the capital gains, dividends and interest on investments earned by these many millions of new middle class investors also could not be taken out before retirement age. So no cash could come out (without a significant penalty), but rather all of it had to go straight back into the markets and to buying still more investments, supporting market prices and driving them higher. Thus with an investment made thirty years before retirement, it wasn't just that the original contribution itself couldn't be cashed out, but every single cash payment received over those thirty years also had to stay in the markets. Now, for the general public, this mandatory reinvestment of all cash flows over the decades may not sound like such a big deal, at least not as important as the original savings. 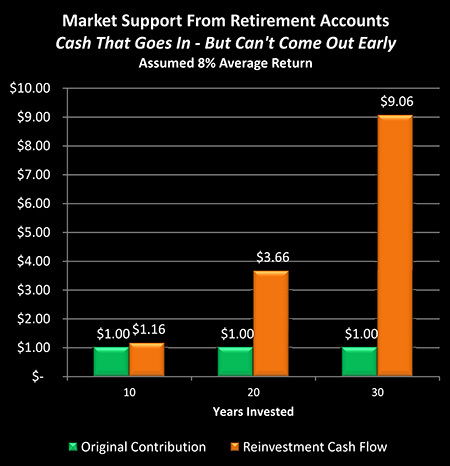 In truth, however, this required 100% reinvestment of cash flows received would become the single largest and most reliable source of market support by retirement account investors. Indeed, it is the reinvestment of income that is the core of conventional financial planning. As explored here, after someone had been saving for a number of years, the goal was for these reinvestment purchases to grow to be larger than the annual contributions from their working income, and then twice as large, and eventually three times as large, and so forth. As shown in the graph, within a long-term retirement account the original contribution becomes dwarfed by reinvestment earnings over time – or at least, that is how it was supposed to work. What matters most for the market when it comes to driving pricing upwards is not the original $1.00 retirement account contribution that can't come out, but rather the $9.06 in investment earnings over 30 years that also can't come out. The idea is sometimes referred to as "our money working for us, instead of us working for our money". And eventually, that is how it is supposed to work out, once we are retired. But in the meantime, this twist in retirement account legislation absolutely transformed the markets, because all that income from all those millions of people for all those years went straight back into the markets – seeking a home, increasing the supply of money seeking investments each and every month, and fundamentally altering the laws of supply and demand when it came to investment prices. A paper wealth cyclone of sorts was created, that effectively generated its own weather pattern. The money could go in – but not come out, not for a very long time. The money, the paper wealth, would steadily throw off more wealth – but that also couldn't be spent. Instead, it had to go straight back into the financial markets. Driving prices still higher, creating still more paper wealth, which couldn't leave, but had to say in for another round of driving prices higher. Year, after year, after year. 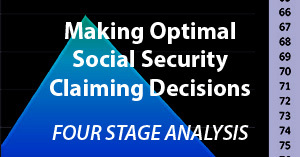 Inside a retirement account and in the decades leading up to retirement, it is actually somewhat debatable whether our money is really working entirely for us, or whether it is at least equally working for the markets (and the financial firms), thanks to the way the retirement account legislation was written. Even those employees who never contributed a dime to these self-directed plans still became investors on a massive scale by way of pensions given to them by their private and governmental employers – who invested in the markets on their behalf. The flow of cash into pension-plan investments was also a one-way street, with the original cash going in but not coming out for decades – as a matter of law – even as every penny of the interim cash earnings over the decades also had to go back into the markets – also as matter of law. Further feeding the paper wealth cyclone with the retirement savings of all of those with pension plans. When we put all of these factors together and look back at these past few decades, the results were pretty fantastic indeed (or at least they were during the 1980s and 1990s). But the issue is we've now entered a pivotal phase in which with each passing day, that massive group of Baby Boomers is reaching retirement age in ever-greater numbers. So when we look to the future then, this begs a simple but essential question: what happens when everyone sells? 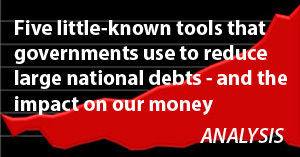 And not only sells, but takes their money out of the markets as it is received instead of reinvesting? What happens to prices and returns when tens of millions of Baby Boomers and their pension funds are simultaneously selling their investments? That is after all the whole idea of investing for retirement – eventually selling our investments, cashing out, and enjoying the proceeds in our golden years. What happens when the tax laws reverse what they encourage now, and force sales instead of buying? When Boomers in their 70s and 80s have to be spending down their portfolios instead of adding to them? What happens to prices when instead of cash, cash and more cash pouring into the markets – it is cash, cash and more cash being pulled out of the markets? Words like “Boomer Bust”, “tidal wave”, “crash”, “battle” and “storm” have been used to describe what will happen to the markets, within the small section of the investment community that has been anticipating the consequences of the Baby Boom collectively selling its investments. As if some monstrous one time force will rise up out of nowhere and come crashing through the markets, leaving devastation behind it before dissipating. There is an element of truth to that "high drama" perspective, but rather than a tsunami of some sort I'd argue that a better analogy would be a gradual shift in the tide. For the Baby Boom's impact on the markets isn’t some hypothetical force to be reckoned with at some future point down the road – it is what has dominated the markets already for the last 35 years. A rising tide of cash has lifted all the boats over the years, and shaped the way an entire generation looks at the markets, along with our expectations for returns. Whenever we look to returns, or prices, and consider what is reasonable to expect when it comes to future results, we tend to view it from within the framework of our personal experience over our lifetimes – which is that of cash steadily pouring into the markets for decades. Now the tide is not yet actually receding, but we are nearing high tide, and the rate at which the tide of cash is coming into the markets is starting to slow. The Baby Boom is aging, those born in the 1940s are already retiring in large numbers, even as more and more of those born in the 1950s take early retirement. But the substantial majority of Baby Boomers are still in their peak earning years. Indeed, some are just now reaching those years – so the Baby Boom cash influx isn't over with yet. 5) Other investors have to come up with the cash to buy out their portfolio and pension investments, cash that will not be available for other investments. For going on 35 years now, those first four factors have been building and pouring more cash into the markets each year, supporting them and steadily lifting prices, while smoothing out the rough areas – even as they increased the paper value of all those portfolios and pension plans. When the time comes for people to actually cash in on that value however, with their counting on prices much higher than today – the tide will be going out fast. How much will that lower the prices? Now one could argue that millions of people have retired before and sold investments without crashing market prices. That is certainly true, and millions of people are currently drawing down investment portfolios in retirement right now. One could also say that even with as large as the Baby Boom is, there will still be more people investing than divesting, thus more savers than people cashing out – and that would be true as well. What's crucial to take into account however is not simply people, but total cash in versus total cash out. That is, when we get past the government accounting shenanigans, as covered here, what really matters with Social Security is the number of people paying into it, versus the number of people collecting benefits. And by the time the Baby Boom has fully retired, we will be down to about two people paying in for each person collecting (according to Social Security Administration projections), which is the heart of the true problem facing Social Security. While that ratio is widely acknowledged, what has generally been overlooked is that the exact same demographics will also be applying to retirement investing, pensions and the markets as a whole. For investments do not exist in some isolated world of their own apart from the rest of society. If we look at the long-term history of the markets (for our comfort from long-term rates of return), they are based on ratios such as what existed in 1950 when there were 16 workers for every one retiree. For stark comparison, by 2030 we will be down to about two people saving for retirement for every one person who is selling securities to fund their retirements. Now there is of course more to the markets and investing than just retirement investing. Other retirement investors will not be your own sole source of cash, and inflation also needs to be taken into account. However, the shift in population demographics along with behavior, laws and perceptions that has led to about fifty million Baby Boomers becoming investors – has profoundly impacted the markets. Financial markets feed and thrive on cash, and every month for decades the markets have been swelling with portfolio and pension contributions, as well as the more important reinvestment of portfolio and pension investment earnings. These four supporting pillars of the market will first be neutralized, and will then reverse altogether, sucking cash out of the markets instead of adding back in. The very powerful cumulative effect of these changes is necessarily negative on the prices that Baby Boom investors will receive for their investments. Cash flowing into the markets and the demand for long term investments will be steadily falling even as a larger supply of investments is offered for sale each year, as the entire Baby Boom gradually retires and starts to cash in, as well as enjoy the hard-earned benefits of their pensions. How negative will the effect be? Financial history would usually be a good place to look for answers, but unfortunately, history can't offer guidance here. That is because none of this has ever happened before. In the not-too-distant past, most people were too poor to accrue any savings, and they died too soon to enjoy them anyway. 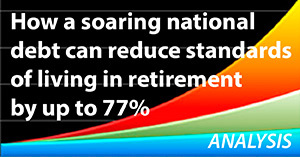 There are about fifty million Boomers who have retirement accounts, pensions or both. We have never had fifty million people expecting to be supported directly or indirectly through the ongoing sale of investments. Over the last 35 years, we’ve seen what the largest and wealthiest generation can to do the markets when most of them are simultaneously buying – but we have no history for what happens to prices when so many people try to cash out so much for so long. When we look at all government retirement promises over the coming decades – the total is simply unpayable. As explored in the "eye opener" linked here, this means that there is a high probability of an eventual tax code "revolution" that could rewrite all the rules when it comes to the future treatment of our current retirement accounts.